My colleagues and I would like to introduce ourselves to you. 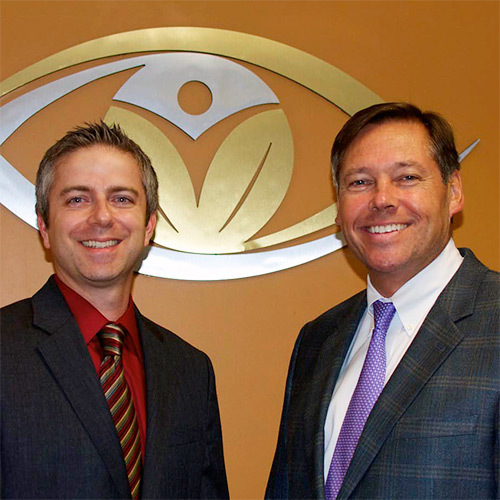 We are Dr. David P. Bartels & Dr. Michael S. Murphy. We hope to provide quality eye care to the residents of Clarence, and Western New York, for many years to come, and we look forward to providing you with the highest quality of care. Our philosophy is to provide thorough eye exams on all of our patients ages 4 and up, using the most current and advanced technologies. Come visit our beautiful boutique with great frames priced for every budget. We offer old fashioned service providing repairs free of charge for most problems. We have a beautiful, newly remodeled office and optical boutique with new frames, priced for every budget, and we still provide repairs free of charge for most problems. We also accept most insurances including Medicare and EyeMed. Perhaps the biggest improvement (besides eye examinations) is convenience. Our office will be open evenings and Saturdays.